A beginner can follow a routine for all round gains, but when it comes to a specialization program you must plan that program for yourself alone. Beginners can stick to rigid rules when they commence weight training, more seasoned lifters must take into account such factors as body structure, diet, temperament and personal living habits. Those with a narrow shoulder width due to skeletal structure need not be disheartened. If you can’t believe this, consider the case of Doug Hepburn. Measured for shoulder structure, Doug was shown to possess shoulders of average width. But when measured for actual shoulder breadth, he has one of the widest pairs of shoulders in the current world. 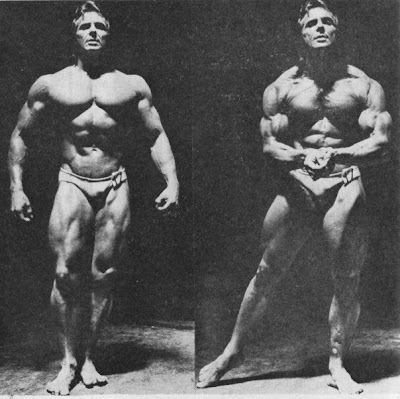 This shows that great shoulder size in not merely a matter of owning a large bone structure, but also one of muscle size. The more you work on your deltoid muscles the broader you will become. What about diet? You’ve certainly heard the expression, “one man’s meat is another man’s poison,” and it is true that certain foods will agree with one lifter and cause disturbance in another. But these occurrences are fairly rare. Lifters, for the most part, either have or can develop healthy appetites, and can generally eat anything . . . and frequently do, which is where the trouble lies. Make sure you obtain a generous diet rich in all the foods necessary for good health. If you cannot currently take in enough food to grow on, a progressive system of adding more to each meal will eventually solve the problem. And what of temperament? There are some lifters who insist on driving themselves whether they feel like taking a workout or not. But the wise, experienced man adjusts his workouts to the way he feels on that day. If he is tired or lacking in energy, he takes things a bit easier. If he feels nothing can stop him then he really opens up and goes all the way. This is really no outstanding or elusive “training secret” . . . nothing more than common sense applied. And he maintains favorable temperamental factors by selecting a schedule of effective movements which he enjoys using, avoiding those that can cause injury to him, if not to others. In this way, training enthusiasm is kept high and the likelihood of physical or mental staleness is diminished. Now, for the training. Notice the title of this article? If you did, then you’re probably wondering how cheating comes into play in increasing your shoulder size and strength. A little reflection on your part will show you that the shoulder muscles are subjected to a great deal of use during every daily activity. Therefore, at times they may need a system that allows the use of heavier poundages to jar them into new progress. In regular, strict training the minor muscle groups can often “give out” before the muscles you are targeting have received their fair share of work. By using a looser, cheating style you place these minor muscles in a more favorable leverage position, and enable the targeted muscles to work to their utmost. You can handle heavier poundages than you have become accustomed to and further stimulate muscle and strength increases. I will give you eight movements from which you can select four to comprise your shoulder program, Please DON’T attempt to use all of them in one workout. Select four and work on these with every ounce of your power that day. Better still, use a different routine every week, regardless of how often you use this routine each week. The first week, begin with exercises 1 to 4. The second week start with exercise 2 and go on to 3, 4, and 5. The third week start with exercise 3 and go on to 4, 5, and 6 . . . and so on. Start off with a poundage you can handle for 3 sets of 5 repetitions, and work up to 3 sets of 9 reps before adding weight. Don’t be afraid of going below 5 repetitions on days when your energy is high. Handle as heavy a poundage as possible and really force out the last few repetitions. Wide Grip Seated Press Behind Neck – Sit on an exercise bench, your hands touching the inside collars on the bar, which rests behind your head across the back of your shoulders. Press the weight up to arms’ length for the first rep, then lower it quickly and with a little rebound, press it back up to arms’ length again. Don’t pause between reps but get that little muscle rebound to force out each repetition. Don’t be afraid to cheat a little with a slight lean back, to get the bar to arms’ length. Standing Cheat Lateral Raises – Stand erect with a dumbell held in each hand, arms slightly bent at the elbows. Bend the body forward and then swiftly return it to upright position, at the same time using this body motion to swing the dumbells up to shoulder level. Don’t go above shoulder level position and do all you can to lower the dumbells as slowly as possible. Remember to keep your arms bent to take the strain off the elbow ligaments, and experiment with holding the bells with palms facing forward to relieve any possible strain on the shoulder joints. Seated Alternate Dumbell Presses – With a dumbell held in each hand, seat yourself on a bench. Press one dumbell to arm’s length and lower it, at the same time pressing the other dumbell up to arm’s length. Continue pressing the dumbells alternately. When you lower the dumbells down to the shoulder, do so quickly and bounce them up again by leaning slightly over to one side as you press the weight up. Don’t pause between reps. Don’t forget to use that bounce off the shoulders and lean over to the side as you press each dumbell. Wide-Grip Bench Presses – Lie on a flat exercise bench, a barbell held at arms’ length above your chest, gripping the bar with a collar-to-collar hand spacing. Lower the bar down quickly and with a slight bounce off your chest, press it to arms’ length and repeat. Don’t pause between reps and don’t be afraid to BRIDGE to grind out those last two or three tough repetitions. 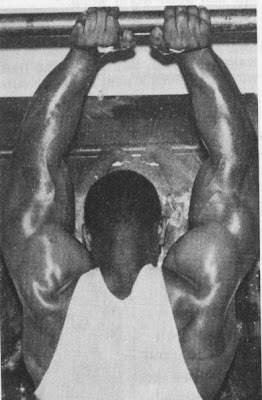 Cheating Bentover Row – Bend forward, a barbell held in the hands at full downward stretch of the arms, knuckles to the front. Your hands should be shoulder width or slightly wider apart. Drop the body down and return it to level position, combining body motion and pulling power to bring the barbell up to the waist. Lower the bar down SLOWLY to commencing position and repeat. Don’t be afraid to use plenty of body heave and all the weight you can handle. 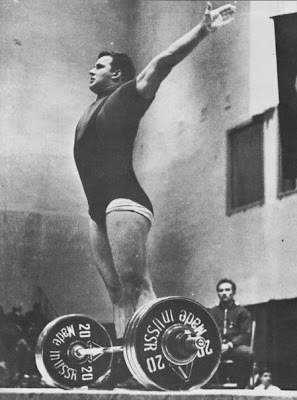 Standing Press Jerks – Here’s an exercise partly responsible for Doug Hepburn’s pressing power. Take a barbell out of the squat racks across the shoulders, into the start of the regular two-arm press. Don’t use too wide a grip . . . just slightly more than shoulder width. Bend the legs at the knees and straighten them suddenly, thus jerking the weight part way up. The bar should be jerked enough to take it to just above the head, where it is pressed out to arms’ length. Now here is the important part of the exercise – keeping as erect as possible, lower the bar back to commencing position SLOWLY and repeat. Cheating Bentover Laterals – With a dumbell held in each hand, bend the body over at the waist until it is level with the floor and the arms are hanging down at full stretch from the shoulders. Now bend the arms a little, drop the body down, then quickly snap it up to a little above horizontal position, combining body motion and arm movement to being the dumbells up and sideways to shoulder level position. Lower slowly and repeat. Don’t pause between reps and don’t be afraid to use plenty of body motion, remembering to lower the bells slowly. Incline Bench Forward Raises – With a barbell held in the hands, knuckles up, lie on a steep, upright incline bench, the arms at full downward stretch. The bar will be resting on the hips or tops of the thighs, depending on your arm length. Raise the body from the hips up, off the bench and then as you lower it down again, combine body motion and arm movement to raise the bar up to shoulder level position. Don’t go above shoulder level position and don’t forget to keep your arms bent at the elbows. Lower the bar SLOWLY back to commencing position and repeat with no pause between repetitions. And now I repeat to you . . . I don’t care how narrow-shouldered you are. Hard, consistent work on your deltoid muscles will broaden your shoulder width over time.